Alistair Gentry currently lives in the UK and makes work for publication, performance, broadcast and installation which is often “subversive” (SFX), at times “startling” (The Independent) and occasionally even “fascinating” (The Times). He has exhibited at La Biennale di Venezia, been awarded the Berwick Gymnasium Artist Fellowship by English Heritage and Arts Council England, and worked extensively in China and Japan. In 2010 Alistair Gentry wrote a successful memoir of being a fairly unsuccessful artist, Career Suicide. He is currently working on his next book Gentlemen and Players which will be a more analytical account of the careers and livelihoods of artists in the twenty-first century. As an artist who works outside the commercial gallery system, and seems to go out of his way to comment on, and sometimes interrogate the system which most artists would give their eye teeth to be accepted by, I wanted to find out how Alistair Gentry survives as an artist and if he has any thoughts or advice on ‘balancing art and business’ for younger artists. Alistair Gentry, could you tell us a little bit about how you survive as an artist and does it make it harder for you having this renegade reputation? The short answer is no, the opposite. It only pisses off the energy vampires, the charlatans and the ego monsters I wouldn’t ever want to work with anyway. Reasonable people aren’t threatened by criticism; they welcome it. It’s still a good question to ask, though, because I frequently dis “important” (they think) galleries and am now definitely known as OH, THAT GUY… I know for a fact that they all hate-read my blog. While I don’t exactly feel like I’m thriving, I definitely do survive and I have a lot of support. 90% of the people who’ve worked with me once go on to work with me repeatedly, say it was an absolute pleasure, that I was flawlessly professional, and actively commend me to others. You can’t buy or fake any of that stuff, nor does it come to you automatically as your just reward for being a good little girl or boy who doesn’t rock the boat. 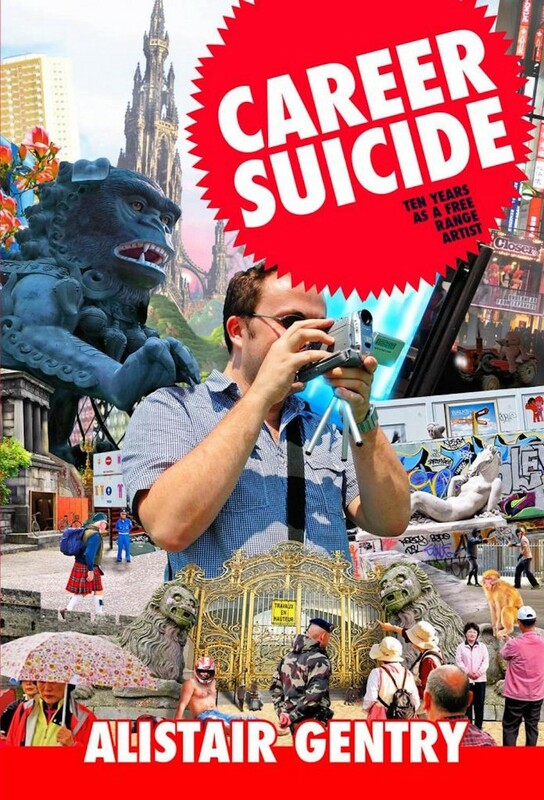 The Career Suicide book goes into how it all works in some detail, so reading it is probably the best way to get an initial grip on where I stand. Sales of the book itself have supported me. Right now I’m about a third of the way through writing a follow up, with the working title Gentlemen and Players. It’s less personal and much more analytical about (among other things) precisely the issue you raise, that of balancing what I think is the real purpose of being an artist- i.e. to make art that connects with people, makes them think or feel something, takes them out of the world or connects them to parts of it they never knew- and the business/admin/networking stuff that, like it or not, also goes with the territory. Alistair Gentry, would you ever want to be represented by a gallery? I was represented for a number of years by a non-commercial gallery, ArtSway, who had an outstanding reputation for supporting artists. It was a joy and they did a lot for me. I’d willingly embrace that kind of supportive and unconditional relationship again, but it doesn’t really exist in the commercial sector unless– possibly– you’re one of the top hundred or so mega artists in the world… and they’re all beyond the realms of normality in every other way, too. Taking them as a model makes no more rational sense than aspiring to be an astronaut or a princess. There are a few real ones, but it probably won’t be you. I’m not really part of any kind of commercial scene anyway. Don’t want to be, probably couldn’t be because I’ve studiously avoided making any kind of unique, monetisable and ownable objects. Doesn’t interest me. The few exceptions have been things specifically meant as saleable objects and not presented as art, more like housewares or collectibles. The commercial gallery industry is just not for some artists. Probably not even for most artists, but unfortunately it’s where most of them look in vain for their validation and careers. This is horribly unhealthy and sad, like stalking a stranger after they’ve declined to marry you, with a carrier bag full of wedding magazines in your hand. The commercial gallery scene is actually not even for some commercial galleries. Some of them play games with the books, they launder money, they obfuscate the tax affairs of the super-rich, or they’re just trustafarian boutique money pits that never profit. The vanity pay-to-hang galleries mostly sell precisely zip, too, because their business model is to extract money directly from artists via fees. They have absolutely no motivation to make any actual sales of art works. This is not me editorialising, I’ve heard it first hand from informants who’ve worked at the commercials, from represented artists, and from several people who interned or worked at one of the worst and most notorious vanity galleries. I’ve been trying to find out from artists how they ‘balance art and business’ do you have any tips or thoughts on this? Artists can’t really win that one decisively. If you’ve no USP or strategy then you’ll get nowhere. A lot of people (including artists) seem to think artists actually should be martyrs and starve unknown in an attic, because apparently being a loser and a failure is cool, and being an artist isn’t a proper occupation anyway. Hey, why don’t you OD or kill yourself as well? It’s cool when artists do that. But then if an artist becomes successful or even just talks about getting paid or the (monetary or intangible) value and change their work can bring to other people, they’re castigated as sell outs, or greedy and mercenary, or derided sneeringly as “community artists” as if they’re somehow less pure, less arty for talking about transactions they didn’t just make up because they actually exist and are necessary. Many artists and lecturers at art colleges are vehement in their suppression of pragmatic talk about being an artist because apparently in some way it sullies the purity of nobody caring about or understanding your art. After one visiting lecture I did for an art course, the head of department said privately to me, “I don’t tell them any of that stuff [i.e. the reality]. It would just scare them.” No wonder so many new artists feel clueless and powerless. If you persist in making work that defies current trends and the requirements of the auctioneers, you’re an Outsider Artist, i.e. either tacitly or overtly labelled as mentally ill because obviously you must be if you don’t comply with Zombie Abstraction or Ganderesque Conceptualism or whatever else is flavour of the month with the twelve critics and six curators who decide these things. Why can’t you just make the same art work as everybody else, even though the art world also fetishes individuality and the unique physical object for sale? Artists simply cannot win, at least not in the current paradigm.